this type of gate is applied to molding of boxes or cups like bathtub, plastic bucket, and others, particularly large sized products. 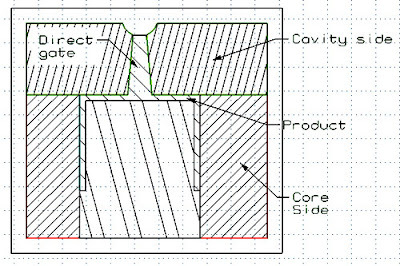 like at the picture above, shown cups product with direct gate before cutting. from picture above the construction of direct gate is one parts with the product, after injection process, the sprue will cut manually. 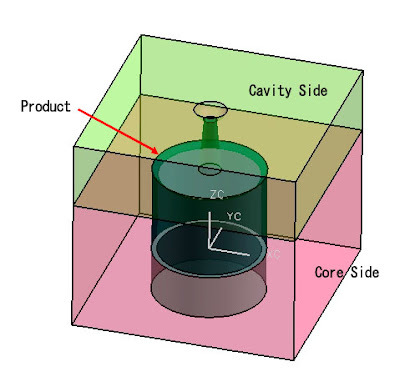 parting line between cavity and core can directly placed at top surface of product or more lower from top surface product, it very depending of product shape and characteristics. - then, make sure the diameter of sprue orifices must be larger than nozzle exit diameter, choose from 1-2 mm or about 1/32 inch. - give taper at the sprue from orifice diameter to product about 1-3 degree, it is will made the product demolded from cavity side more easy. - in general the diameter of the gate much greater than the thickness of the product. - Low cost of design. - The injection pressure was reduced due to direct cavity filling. - Simple way to design gate and runner system. - easy design and maintenance. - since excessive stress is left easily around the gate, cracking often starts around the gate. - when using non standard sprue tapers, will more expensive with little gain. - gate mark left on part surface after runner of sprue trimmed of. 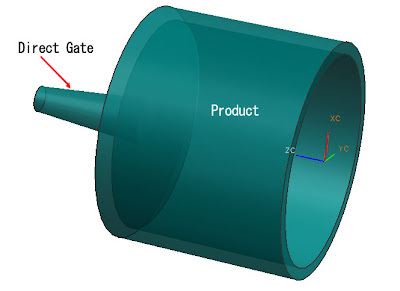 - This gate type can only produce one part per shot. - The gate has to be cut manually by a cutter. - Not applicable in little size product.